For my birthday early in January my parents got me the Ikea Alex Drawers to go with my Ikea Malm Dressing Table that I got last year. My makeup collection had been pilled into smaller drawers and I couldn't see what I had. 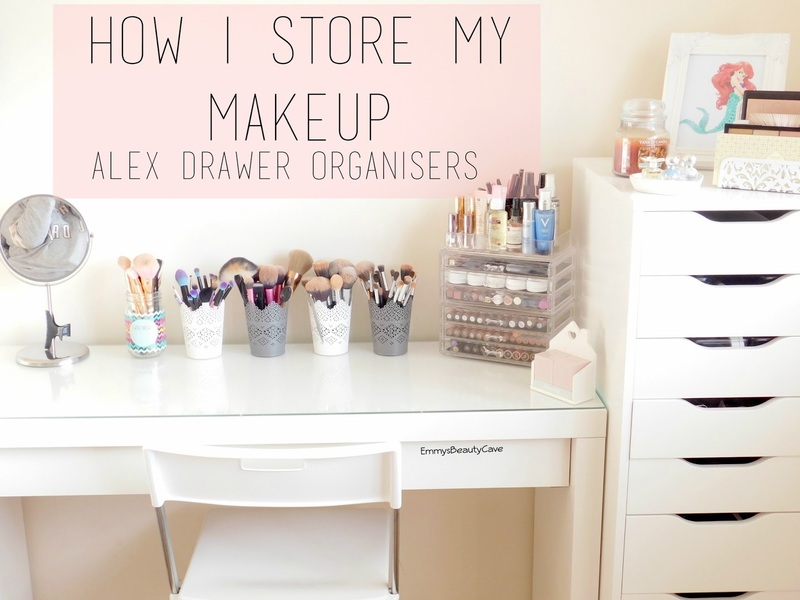 I now have organised drawers and can see everything I own. 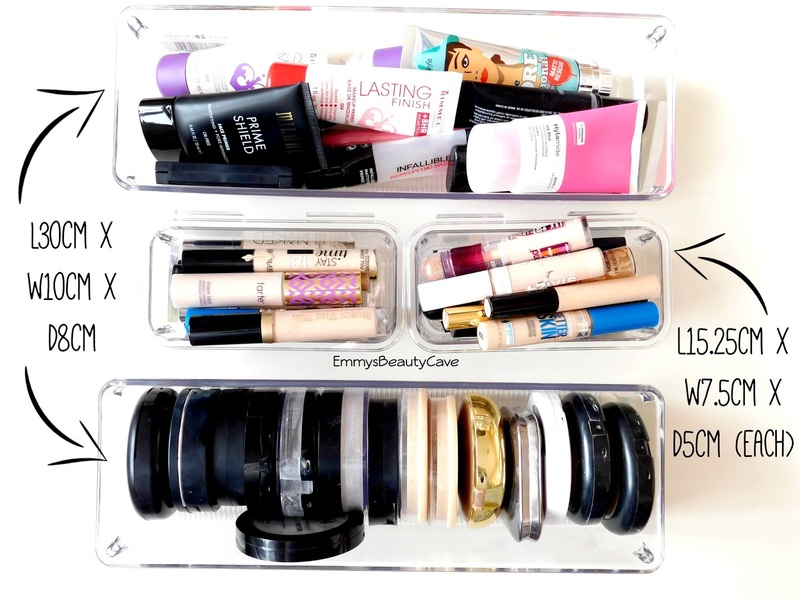 I read Stacey's Bedroom Tour post where she shows her makeup storage and it gave me some idea's, so I searched online and found things that would work. All of the storage I have used in my Alex Drawers is super affordable and I have linked absolutely everything and shown in depth photo's of how they look and what they fit in them. In my dressing table I have all of my foundations. I own around 30 foundations, a couple aren't in my dresser yet. 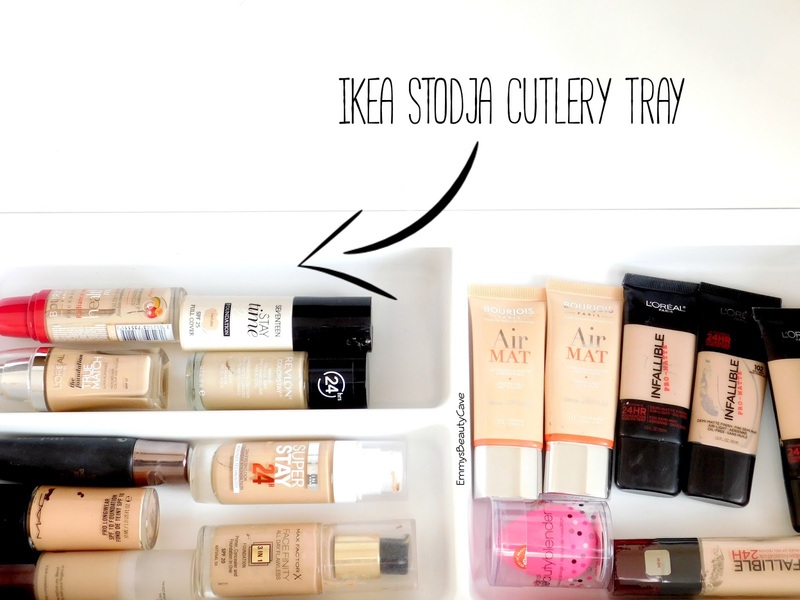 In my dresser I have two Ikea Stodja Cutlery Drawers and they fit perfectly. They are only £1.50 each!! They are white plastic which makes them very easy to clean. They sell them in store and online. Brush Holders: I have used the Ikea Skurar Candle Holders in Grey and White, £2 each. I have also used the Jam Jar Style Mugs, which were from New Look and I just took the lids off. 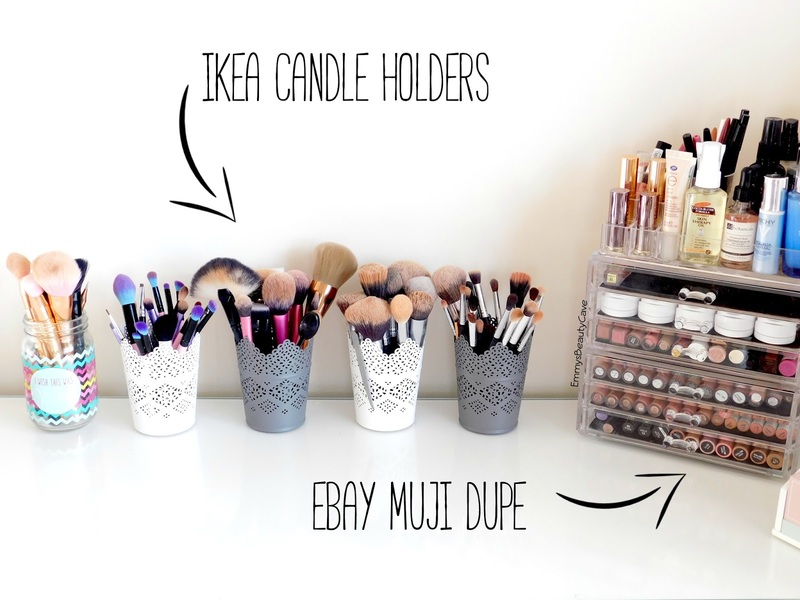 Muji Drawers Dupe: I got these from Ebay which were much cheaper than the Muji ones and they are strong too so won't break. 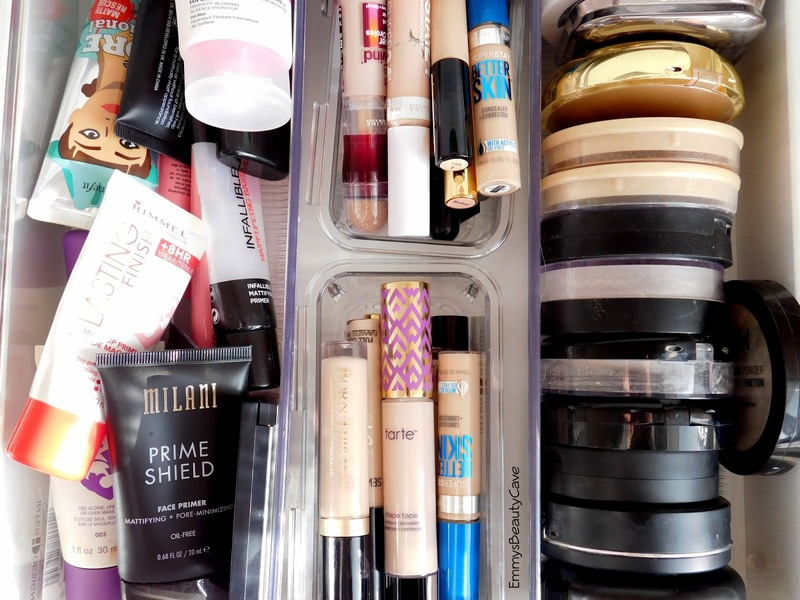 I keep most of my lip products and single Colourpop eye shadows in here. I have two and just placed the drawers on top of one another. 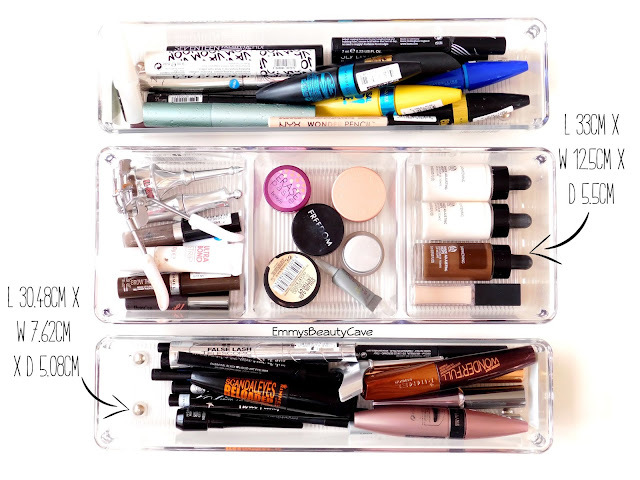 They are the Acrylic Clear Makeup Organiser with 3 Drawers and a top section, £13.99. It is #10 on the Ebay listing. 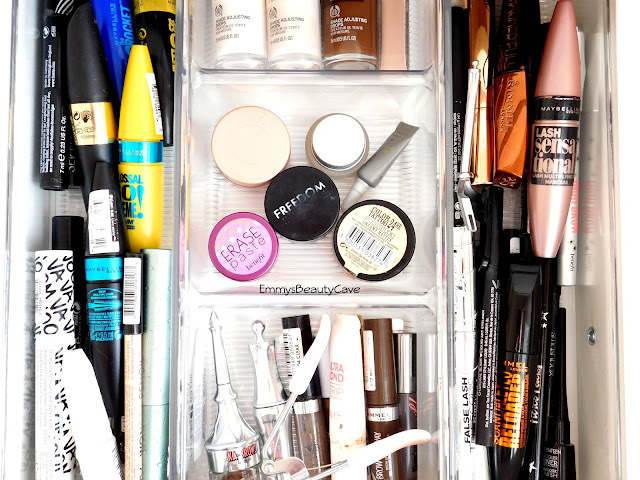 Top Drawer: In this drawer I keep my primers, concealers and most of my powders. These orangisers fit perfectly. Primers: I have used the Linus Drawer Organiser W 10cm x L 30cm x D 8cm £5.99, as you can see it fits alot of primers in and I could still fit more in it. 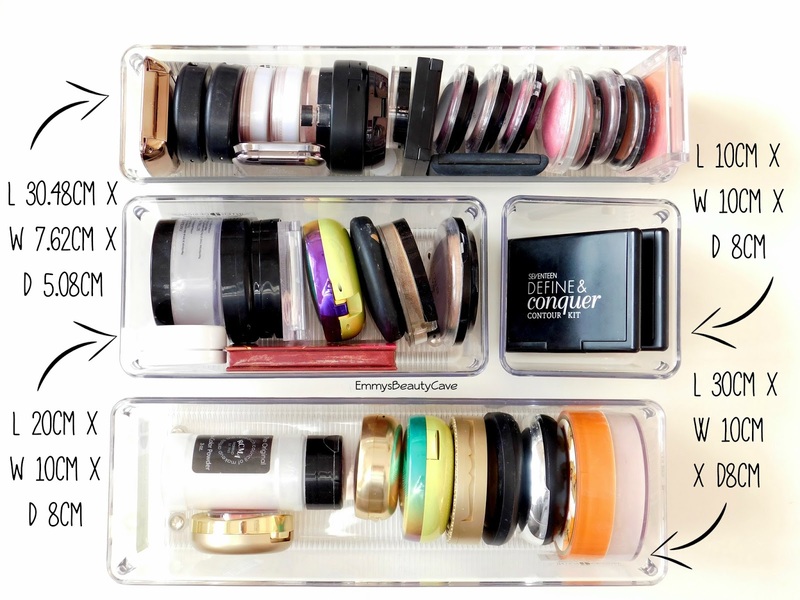 Concealers: I have two of the Linus Interlocking Drawer Organisers £2.99 each, clear, small. As you can see they fit concealers in perfect. Powders: Linus Drawer Organiser W 10cm x L 30cm x D 8cm £5.99, this fits powders in, even the chunkier ones fit well. Drawer Two: This one is full of my blushers and bronzers. Blushers: Linus Slim Drawer Organiser L 30.48cm x W 7.62cm x D 5.08cm £3.99, I fit most of my blushers in this as you can see. 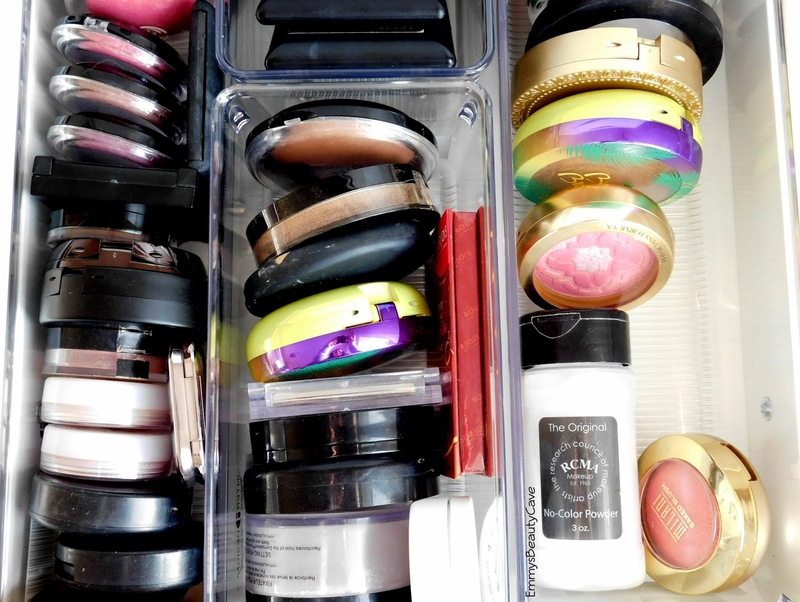 It is just larger compacts I can't but I put them with my bronzers. Bronzers: Linus Drawer Organiser L 20cm W 10cm D 8cm, £4.99. These are perfect as they are wider and deeper than the blusher one and fit all my bronzers and larger powders in. If you wanted you could have two of these in the middle, I have one of these and then the small square one. Longer Bronzer One: This one is the same as the one in the middle but just longer. It is the Linus Drawer Organiser L 30cm W 10cm D 8cm, £5.99. Drawer Three: This is full of my mascara's, liners, brow products and some other bits. Mascara's: I have two of the Linus Slim Drawer Organisers L 30.48cm x W 7.62cm x D 5.08cm, £3.99. 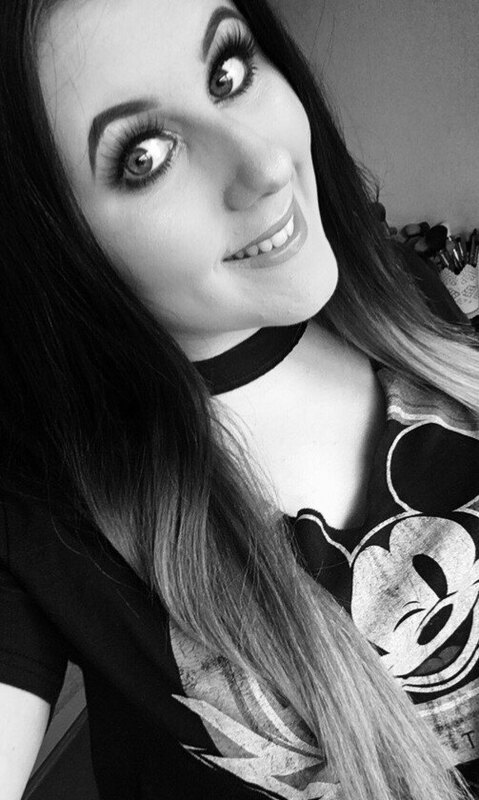 They fit all of my mascara's and liners in so well and I can actually see what I have. Middle Section: Linus 3 Section Organiser L 33cm x W 12.5cm x D 5.5 cm, £6.99. This is handy as I wanted something to seperate the smaller items. 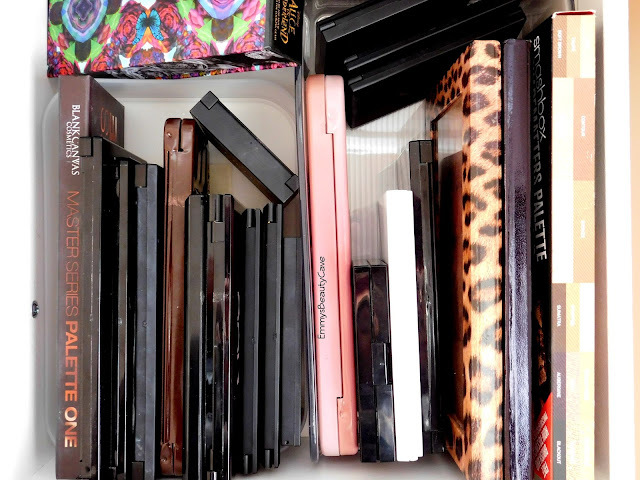 Drawer Four: I have one large container for my highlighters and then I have some of my most used contour palettes. 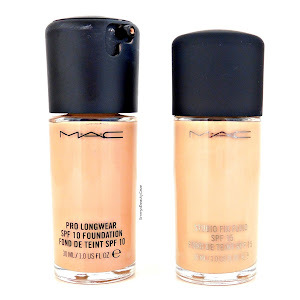 Highlighters: This is the same one that I used for my blushers. It is the Linus Slim Drawer Organiser L 30.48cm x W 7.62cm x D 5.08cm £3.99. Drawer Five: Some lipsticks, I still haven't sorted out all of my lip products. 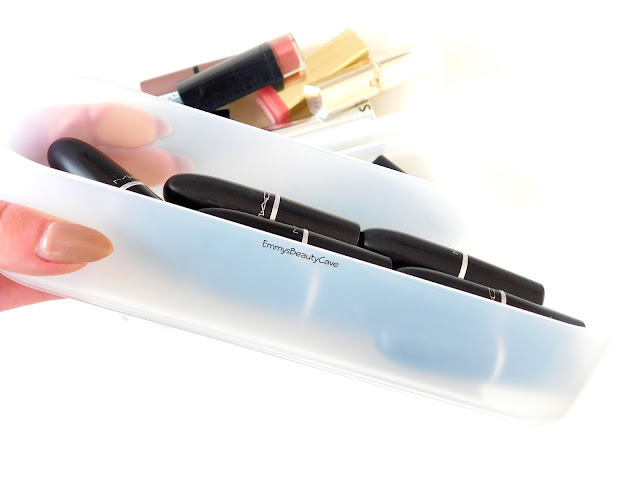 Organisers: Muji PP Vanity Case 1/2 Size Long L 22cm W 7.5cm D 4.45cm, £1.95 each. 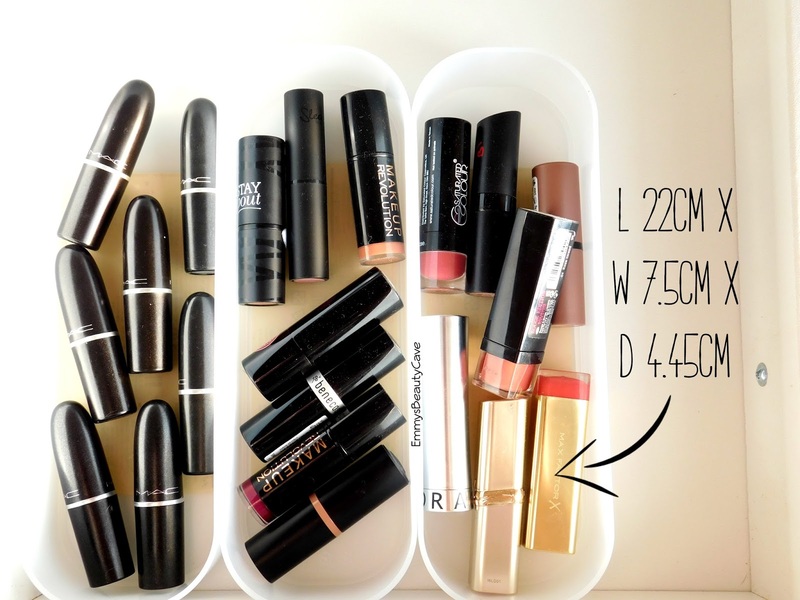 These are perfect for lipsticks, liners, brushes etc... 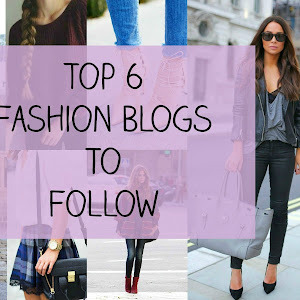 They are long which helps fit alot in them. Drawer Six (Deeper Drawers): Makeup Palettes! Well most of them, I also have some around my room and on top of my Alex Drawers. Smaller Storage: This is a Muji PP Vanity Case 1/4 L 22cm W 14cm D 4.45cm, £2.50. This is perfect as I wanted something that would keep them in place. 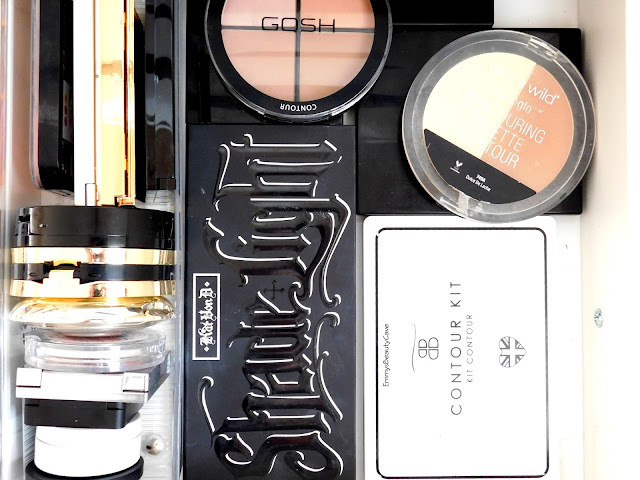 You could also use this to fit in single shadows. Larger Storage: Linus Freezer Organiser L 28cm W 14cm D 9cm, £8.99. This comes in White or Clear. (This will only fit in one of the four larger drawers). 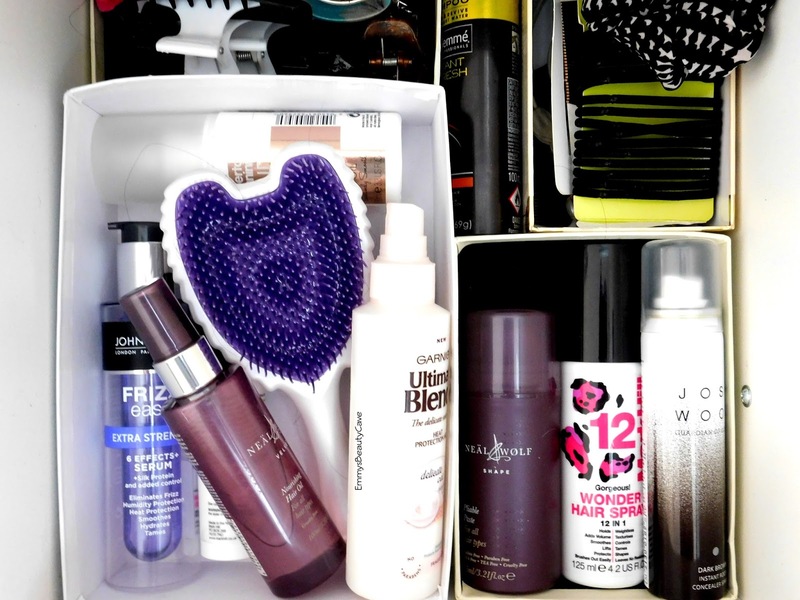 Drawer Seven: I keep Skincare bits and bobs in this one. The cotton bud jar is from The Range, the spooley one is just a box that earrings came in. Large Organiser: Linus 5 Dresser Oraganiser Medium L 30.5cm W 12.5cm D 7.5cm, £6.99. 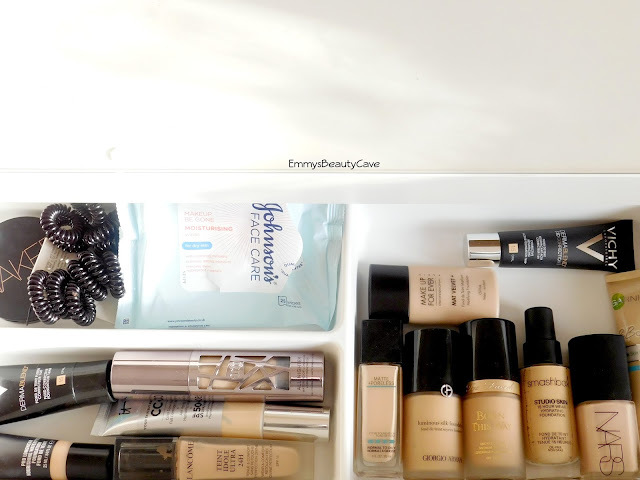 This one is the largest of all the ones I have and it fits perfectly into the deeper drawers for my skincare. Drawer Eight: My hair care drawer. 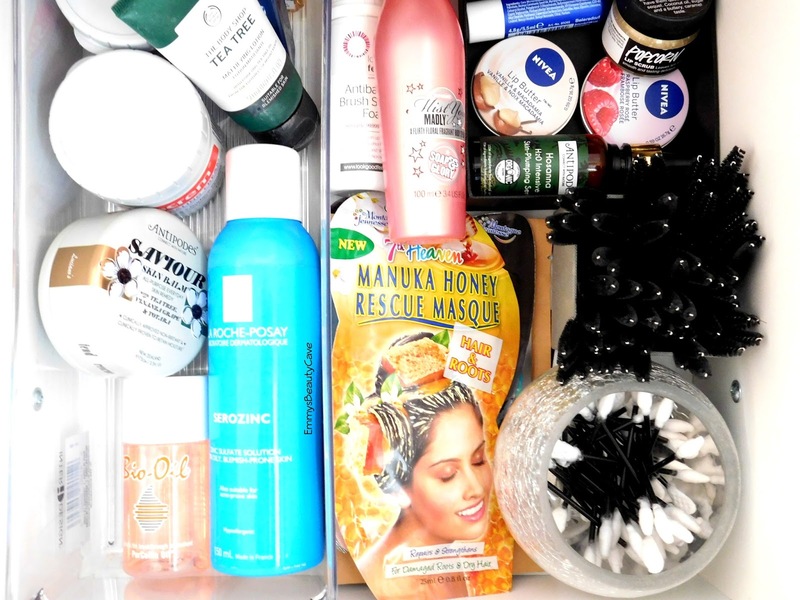 I have just used old boxes that deliveries have come in and beauty subscription boxes. If you shop via the Muji website there is no minimum order and delivery is £2.95. My order came within 10 days. ALL of the Linus Drawer Organisers are linked individually above but they are all from Amazon. Orders do have to be a minimum of £20. 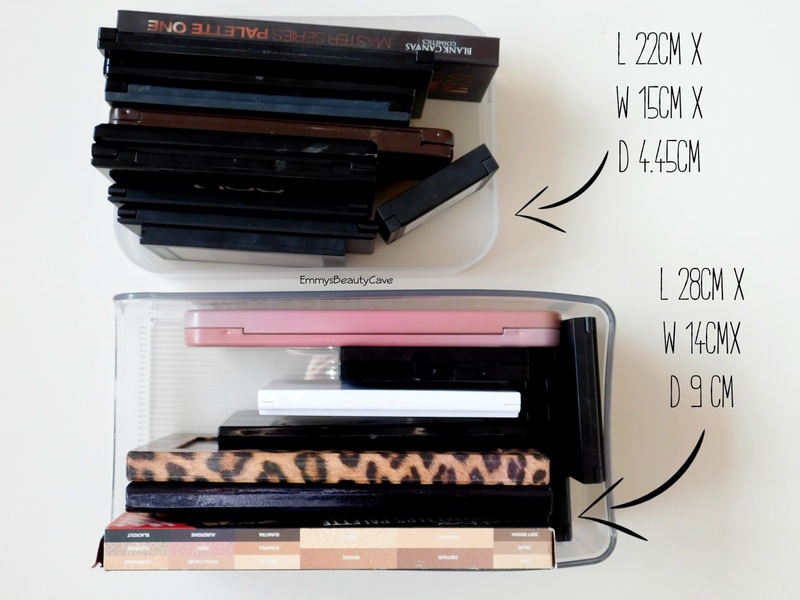 If you order any of them or any of the others they have just remember they can't be longer than 40cm, Wider than 28cm and deeper than 8cm (for the smaller drawers).